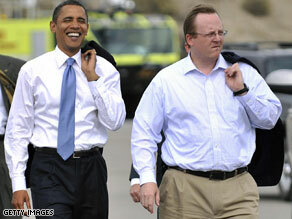 Barack Obama has named Robert Gibbs his press secretary. (CNN) - President-elect Barack Obama's transition team on Saturday announced several key appointments to his communications team. Ellen Moran, the executive director of EMILY's List, will serve as Obama's communications director. Moran worked for the AFL-CIO, coordinating "Wal-mart corporate accountability activities," before returning to EMILY's - an organization dedicated to helping Democratic women get elected to office. Robert Gibbs, an Obama campaign spokesman who also has acted as spokesman for the transition, will become Obama's press secretary - one of the most highly visible roles in the administration. Gibbs, an Auburn, Alabama, native who has worked for Sen. Fritz Hollings, the Democratic Senatorial Committee and Sen. John Kerry's presidential campaign, was communications director, then a senior strategist, for the Obama campaign. Dan Pfeiffer, current communications director with the transition team, will be Obama's deputy communications director. He began work with the Obama campaign in January 2007 as traveling press secretary before returning to Chicago to work as communications director. "These individuals will fill essential roles, and bring a breadth and depth of experience that can help our administration advance prosperity and security for the American people," Obama said in a written statement. "This dedicated and impressive group of public servants includes longtime advisors and a talented new addition to our team, and together we will work to serve our country and meet the challenges of this defining moment in history." Why's Bobby Jindal in Iowa? Louisiana Gov. Bobby Jindal heads to the state that kicks off the presidential primary season. (CNN) - Bobby Jindal's in Iowa today. Louisiana's Governor will make a stop in Cedar Rapids to tour some of the damage from devastating floods earlier this year. He'll also participate in a fundraiser with some of the victims from the flooding. Tonight Jindal heads to Des Moines, where he's the keynote speaker at a fundraising dinner for the Iowa Family Policy Center's "Celebrating the Family" banquet, a major Christian conservative event. Jindal's considered by many in the Republican party to be a rising star and his trip to Iowa, the state that kicks off the presidential primary season, is raising speculation that he might be interested in making a bid for the Republican Presidential Nomination in 2012. But Jindal says such talk is misplaced and that he has no plans to make a run for the White House. Jindal was a Congressman from Louisiana's first congressional district when he was elected the state's governor in 2007. At 36, he became the youngest current governor in the country. Jindal was born in Louisiana to parents who immigrated from India. There was speculation this past summer that Jindal was, among others, in consideration for the Republican vice presidential nomination. In late July Jindal squashed such talk, saying he would not be the GOP vice presidential nominee. John McCain eventually picked another GOP governor, Sarah Palin of Alaska, as his running mate. President George W. Bush attends the APEC Summitt in Lima, Peru. LIMA, Peru (CNN) - President George W. Bush, in what could be his final overseas trip as president, called on international leaders to continue his administration's push for free trade despite the global financial crisis. "One of the enduring lessons of the Great Depression is that global protectionism is a path to global economic ruin," Bush told the annual meeting of the 21-nation Asia-Pacific Economic Cooperation (APEC) forum in the capital, Lima. "I recognize I'm leaving office in two months," Bush said as he discussed the Doha trade talks, which were launched in 2001 to help liberalize international trade policies, "but nevertheless this administration will push hard ... so that Doha can be completed and so we can send a message - we refuse to accept protectionism in the 21st century." Touting his record on free trade, Bush said, "Expanding trade and investment hs been one of the highest priorities of my administration. 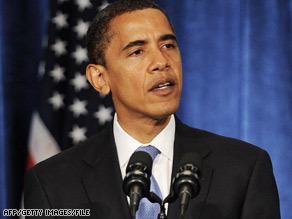 "When I took office, America had free trade agreements in force with only three nations. Today we have agreements in force with 14." President-elect Barack Obama's transition team is subjecting prospective employees to rigorous vetting. (CNN) - When it comes to vetting potential high-level advisers, is President-elect Barack Obama too cautious for his own good? As a presidential candidate, the former Illinois senator quickly adopted the nickname "No Drama Obama" for the meticulous level of prudence he applied to nearly every campaign speech, strategy decision and personnel appointment. The result was a nearly two-year-long presidential bid most notable for its seeming lack of a damaging gaffe or embarrassing misstep. But some political observers say the president-elect's similar caution with respect to recruiting new administration officials and key high-level advisers may be turning away a string of qualified candidates wary of subjecting themselves and their families to the most rigid presidential vetting process on record. 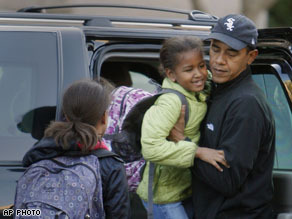 (CNN) - Obama spokeswoman Stephanie Cutter confirms to CNN the Obama daughters will attend Sidwell Friends school in Washington, DC. "They looked at a lot of great schools but they felt Sidwell fit their best interests," spokeswoman Stephanie Cutter told CNN. Chelsea Clinton also attended the school when her father was in the White House. Mukasey collapsed at the podium on Friday. 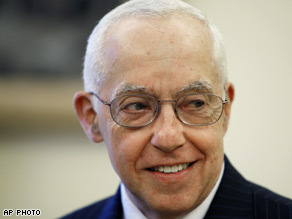 (CNN) - Attorney General Michael Mukasey collapsed while giving a speech Thursday evening. CNN had a camera rolling during the event, giving us an unusual look at what happened. I got a call in the middle of the night to come take a look. (Watch Video) Even doctors, while we read about diseases and see patients after they end up in the ER, we hardly ever witness things like this. I decided to blog about it this morning, hoping we might all learn something from seeing what happened to Mukasey. During his speech, he seemed to have word-finding difficulties. He started to say a word, paused and repeated it. He then began to slur his words, and had a slight drooping of the right side of his face. After that, he slumped forward and passed out, requiring assistance to the ground. All of these events serve as clues as to what may have caused the problem in the first place. (CNN) - Saying that moving quickly is imperative, President-elect Barack Obama on Saturday offered an outline of his economic recovery plan to create 2.5 million jobs by 2011, saying American workers will rebuild the nation's roads and bridges, modernize its schools and create more sources of alternative energy. "These aren't just steps to pull ourselves out of this immediate crisis," Obama said in the weekly Democratic address, posted on his Web site. "These are the long-term investments in our economic future that have been ignored for far too long." Details of the plan are still being worked out by his economic team, Obama said, but he hopes to sign the two-year, nationwide plan shortly after taking office January 20. He referred to figures out this week showing that new home purchases in October were the lowest in 50 years, and that 540,000 new unemployment claims had been filed - the highest in 18 years. "We must do more to put people back to work and get our economy moving again," he said. More than a million jobs have been lost this year, he said, and "if we don't act swiftly and boldly, most experts now believe that we could lose millions of jobs next year." 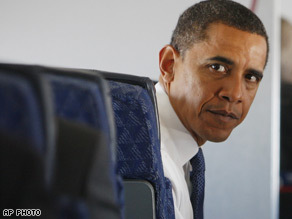 The plan will be aimed at jump-starting job creation, Obama said, and laying the foundation for a stronger economy. economy competitive in the years head," he said. He noted he will need support from both Democrats and Republicans to pass such a plan, and said he welcomes suggestions from both sides of the aisle. Freshman lawmakers struggle to find affordable housing. (CNN) - Newly-minted Utah congressman Jason Chaffetz, like many freshman members of Congress, is trying to get settled in before the new session begins. That means quickly getting assigned an office and finding a place to live when in Washington. To defray costs on housing in DC, some lawmakers choose to room together and split rent. Others find small, basement apartments. Low-end spaces in D.C. run about $1,400 per month. But Chaffetz has another idea: a cot. He plans to camp out in his office and shower at the gym in the House. Lucky for Chaffetz, he drew a low number in the office lottery this morning, which means he'll have his pick of available offices. "I can look for ones with windows," says Chaffetz. "That's important when you're going be sleeping there."